"I don't trust the policy of the United States… but this does not mean I reject a pacific solution to the conflicts,” iconic former Cuban leader Fidel Castro commented on the push for a restoration of Cuban-American ties. This is the first time the revolutionary ex-president has spoken publicly since the December 17 US push for a historic reconciliation between the two nations. The comments also come on the heels of Obama’s Congressional push to lift the five-decade Cuban embargo and his granting the State Department six months to review Cuba’s status on the terror list. In another historic rapprochement, Cuba celebrated when Obama agreed to the release of 53 of its prisoners earlier in January, with only a few remaining behind bars. 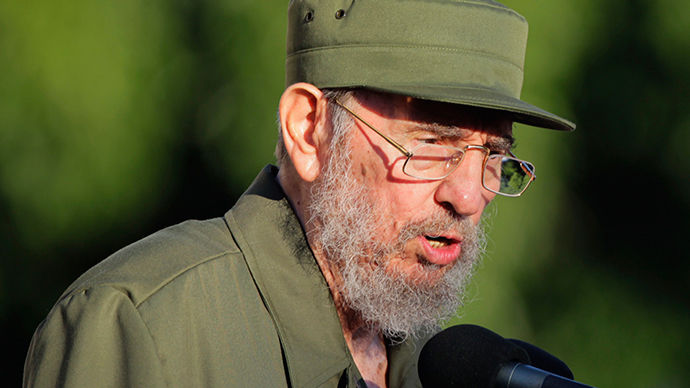 The 88-year-old Castro does not “trust the US, nor have I exchanged any words with them,” he wrote in a letter addressed to the student federation at the University of Havana and printed in the Communist Party newspaper Granma. Castro’s statement on the United States also comes two weeks after the former communist leader penned one to football icon Diego Maradona. That move ended almost three months of suspicions that the former leader had passed away. Castro had been missing from the public eye the whole time, fueling the rumors. The revolutionary was forced to step down from his duties as president and hand the reins over to his brother Raul when he became seriously ill in 2006. Although Castro had reconciliatory words on the relationship with the US, the former president has still not voiced his opinion on his younger brother’s decision to reconcile with Cuba’s age-old enemy – the same country that tried numerous times to assassinate Fidel, which is a world record. "Cuba's president has taken steps within his range of authority and the powers granted him by the National Assembly, and the Communist Party of Cuba," Fidel’s measured words read.